What will you put beneath your playground? Playground equipment is but one of the things you need to consider in the play environment you provide. Equally important is what type of surfacing you’ll select to cushion the feet and falls of the children your community serves. Although there are many options available, there’s no one size fits all solution. You’ll need to weigh the pros and cons of each surfacing type to decide which one fits your needs the best. First off, consider the purpose of safety surfacing – which is to prevent serious head injuries and death. No matter what you put down there’s no foolproof surface that can eradicate scrapes, bruises, and broken bones. However, each type of surfacing, when installed to the required regulations, will accomplish the ultimate goal of preventing fatal injuries. The thickness or depth of the surfacing will be determined by the height of your play equipment and as you can probably imagine, the higher the equipment the thicker your surfacing will need to be. 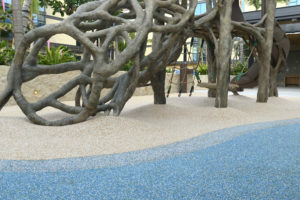 Playground safety surfacing can be divided into two main categories: loose fill and solid…. Sand, engineered wood fiber, and rubber chips all fall into the loose fill category. These systems require a containment system – generally plastic or wood borders, and are usually the most cost effective (in the short term) but they do have some drawbacks. They will require regular upkeep and maintenance. Good luck keeping the loose fill materials where they’re meant to be! Repetitive movements, as children play, will cause the materials to shift creating dips in the surfacing. You’ll have to rake it out on a regular basis to maintain a consistent depth of cushioning across the play surface. Engineered Wood Fiber (aka Wood Chips): Regular wood chips out of the stump grinder won’t cut it, as the rough edges are a danger for cuts and slivers. You’ll need to purchase specially engineered wood fiber which has the same natural look and feel, minus any sharp edges. One advantage of this loose fill option is that it provides sensory experience for kids who enjoy digging and kicking about the chips. This is a popular choice on the mainland however Hawaii’s tropical environment poses a couple challenges – centipedes for one, who love to burrow into deep beds of wood chips. The hot moist climate also causes wood chips to decompose quickly which means you’ll have to replenish your system every couple years to maintain the required depth for safety purposes. Sand: Great for those who prefer a natural material to surface their play area and provides a great sensory experience for young children. However, you’re better off with a sand table or enclosed sand box because of Hawaii’s huge stray cat populations. The feral cats are known to frequent unattended sand lots at night creating unsanitary conditions… although, there are stories of those who have had success by installing movement sensitive water sprinklers. Also, as with wood chips, because it’s organic matter and won’t all stay in one place, you’ll need to replenish your supply every few years to maintain fall height requirements for safety. Rubber Chips: This is the synthetic option to engineered wood fiber. 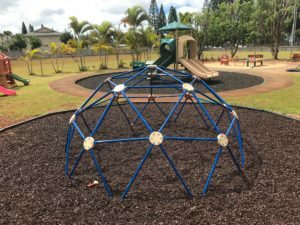 It solves the problem of decomposition making the need to replenish less frequent, but you’ll still need to deal with maintaining a consistent depth throughout the play area to keep safe fall heights. Another potential drawback with rubber chips is the tendency for the colors to rub off on children’s hands and feet. Here we have 3 main options : synthetic turf, rubber tiles, seamless poured in place rubber. These systems will cost you more in upfront investment costs but can last 10 -15 years or more and are virtually maintenance free. Synthetic Turf: Synthetic grass generally costs slightly less than seamless rubber and is becoming more and more popular as the technology and quality of turf products continuously improve. Today’s synthetic turf is very durable and looks amazingly lifelike! People are attracted to the natural look due to the many options in blade length and colors that allow it to closely match existing conditions. 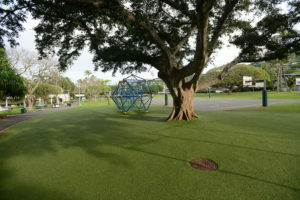 For playground applications a layer of foam padding lies beneath the turf carpet for impact safety and microbial infill is raked into the top of the turf to add extra cushioning and help the turf blades stay fluffy. On the downside, it requires more maintenance and will show the effects of wear and tear over time more than it’s rubber surface counterparts. Gentle regular raking to help keep the blades from matting and monthly washes with a hose will help it look its best for as long as possible. Rubber Tiles: This is a great solid rubber option that is long-lasting and beautiful. Rubber tiles come in many color options of interlocking squares that can be placed alternatively to easily create beautiful patterns and game boards. Little to no maintenance is required and in the case that a tile gets damaged it can be easily replaced with a new tile avoiding cutting and patching required for repairs to seamless rubber systems. The only disadvantage is that dirt and other environmental particles can collect in cracks between tiles and as the system ages there can be bowing or lifting at the edges of the tiles. Poured in Place Rubber: Also known as seamless rubber this tends to be the king of playground surfacing. It’s incredibly durable and virtually maintenance free. If your playground will be serving lots of kids on a daily basis it will be worth every penny! A poured in place rubber system can handle heavy use and will easily last 15 years and more. Both seamless rubber and tiles must be installed on a concrete slab (which accounts for increased expense of these systems.) The seamless rubber itself consists of two layers a thick pliable underlay of recycled rubber that constitutes the safety cushioning portion of the system and a colorful top layer composed of small rubber granules held together by a chemical binder. The main color choices are red, green, and tan for their lower cost and superior colorfast abilities over time. Other color options are available if needed and you can get creative by combining selections to create sweeping organic lines and swirls or even creative cut-outs of simple shapes like stars, flowers, fish, etc. There really aren’t any downsides to seamless rubber. Holes or cracks that open up can be patched and to extend the life of the system and get the most out of your investment you can have a roll-top or overlay done to refresh or replace the top color layer without replacing the entire system. 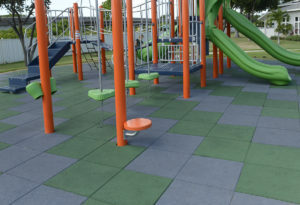 You have a wide variety of selections to consider when choosing a safety surfacing system for your playground and any of these options will help keep your kids safe from serious harm while conforming to regulation and accreditation requirements. We’re happy to share information and answer questions to help you decide on the best system for your needs and budget. CONTACT US anytime to discuss your project!